How do ecologically dominant species of ants and spiders influence plant visiting arthropod diversity and ecosystem services? How do ants serve as ecosystem engineers and impact the soil ecosystem? How effective are ants as bioindicators? What is the chemical basis of tritrophic (ant-plant- insect herbivore) interactions? What is the impact of climate change on some plant associated arthropods? Arthropod diversity and the ecological basis of the association of arthropod myrmecophiles with ecologically dominant ant species. Behavioural ecology of arthropod myrmecophiles and myrmecomorphs associated with plant-visiting ant species. Role of ants as ecological engineers, their impact on the functioning of the soil ecosystem and on ecosystem services. Role of ants as bioindicators of pollution in coal mine spoils. Ant-plant associations and tritrophic interactions including ant-plant-herbivore interactions. Member of the editorial committee of Asian Myrmecology since 2014. Keynote speaker at the 8th International Conference on Ants organized by the International network for Ant research in Asia (ANet) at the Prince of Songkla University, Thailand (2011). National Scholarship awarded during M.Sc., Delhi University, (1976-1978). UGC Fellowships (JRF & SRF) during M. Phil and Ph.D. (1978-1983) awarded on the basis of merit position in the JNU (Life Sciences) Entrance examination. Organized a National symposium on Behavioural Ecology: Molecules to Organisms, in association with the Ethological Society of India, at the Department of Zoology, BHU, in the capacity of Convener (2014). Organized a symposium on Functional Biodiversity and Ecophysiology of Animals, in the Department of Zoology, BHU, in the capacity of Organizing secretary and co-edited the Proceedings of the symposium (2009). 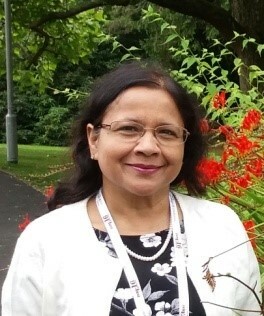 Life member of the International Union for the Study of Social Insects (Indian Chapter) since 2001. Life member of the Association for Advancement of Entomology since 1989. Life member of the Ethological Society of India since 1988. Shukla, R. K., Singh, H. and Rastogi, N. (2016) How effective are disturbance - tolerant, agroecosystem - nesting ant species in improving soil fertility and crop yield? Applied Soil Ecology, 108: 156-164. Shukla, R. K., Singh, H., Rastogi, N. and Agarwal, V. M. (2013) Impact of abundant Pheidole ant species on soil nutrients in relation to the food biology of the species. Applied Soil Ecology, 71: 15-23. Agarwal, V. M., Rastogi, N. and Raju, S.V.S. (2007) Impact of predatory ants on two lepidopteran insect pests in Indian cauliflower agroecosystem. Journal of Applied Entomology, 131(7): 493-500. Agarwal, V. M. and Rastogi, N. (2008) Role of floral repellents in the regulation of flower visits of extrafloral nectary-visiting ants in an Indian crop plant. Ecological Entomology, 33: 59-65. Agarwal, V. M. and Rastogi, N. (2008) Deterrent effect of extra-floral nectary visiting ants on Raphidopalpa foveicollis, a major insect pest of sponge gourd, Luffa cylindrica. Entomologia Experimentalis et Applicata, 128: 303-311. Rastogi, N. (2011) Provisioning services from ants: food and pharmaceuticals. Asian Myrmecology, 3: 103-120. Rastogi, N. (2010) Role of social disorder-related environmental cues as signals in modulating social learning, norm non-compliance and collective decisions in human societies. Current science, 99 (8): 1046-1050. Agarwal, V. M. and Rastogi, N. (2010) Ants as dominant insect visitors of the extrafloral nectarines of sponge gourd, Luffa cylindrica (L.) (Cucurbitaceae) plants. Asian Myrmecology, 3: 45-54. Rastogi, N., Nair, P.; Kolatkar, M. and Gadagkar, R. (1997) Foraging strategies in the ants Myrmicaria brunnea and Diacamma ceylonense: Some preliminary observations. Entomon, 22(1): 79-51. Rastogi, N., Nair, P.; Kolatkar, M. and Gadagkar, R. (1997) Ant fauna of the Indian institute of Science campus- Survey and some preliminary observations. Journal of the Indian Institute of Science, 77: 133-140. Shukla, R.K., Singh, H. and Rastogi, N. (2016) How effective are disturbance - tolerant, agroecosystem - nesting ant species in improving soil fertility and crop yield? Applied Soil Ecology, 108: 156-164. Khan, S.R. and Rastogi, N. (2015) Impact of mining activity on butterfly diversity and community composition. Journal of Entomology and Zoology Studies, 3 (4): 178-185. Khan, S.R. and Rastogi, N. (2013) Recolonisation patterns of orthopteran species in successional stages of revegetated coal mine sites. Halteres, 4: 1-11. SHUKLA R. K. and RASTOGI N. (2012) Seasonal variation in the population structure of the dimorphic ant, Pheidole sp. (Hymenoptera: Formicidae) colonies. J. Exp. Zool. India , 15 (1), 227-231. AGARWAL, V.M. and RASTOGI, N. (2010) Ants as dominant insect visitors of the extrafloral nectarines of sponge gourd, Luffa cylindrica (L.) (Cucurbitaceae) plants. Asian Myrmecology, 3: 45-54. RASTOGI, N. (2010) Plant-insect mutualistic associations and their exploitation by robbers and cheaters. Journal of Scientific Research, section B, Life Science, 54(1&2): 153- 167. RASTOGI, P.B. and RASTOGI, N. (2009) Climate change and its impact on biodiversity A critical review. Minenvis, (62) 1-6. AGARWAL, V.M. AND RASTOGI, N. (2009) Food resource and temporal partitioning amongst a guild of predatory agroecosystem inhabiting ant species. Current Zoology, 55 (5) 366-375. AGARWAL, V.M. AND RASTOGI, N. (2009) Spatiotemporal dynamics and plant-part preference patterns of the plant visiting ants and the insect herbivores of the sponge gourd plants. Journal of Asia-Pacific Entomology, Elsevier, 12: 57-66. doi:10.1016/j.aspen.2008.10.006 . AGARWAL, V.M. AND RASTOGI, N. (2008) Role of floral repellents in the regulation of flower visits of extrafloral nectary visiting ants in an Indian crop plant. Ecological Entomology 33: 59-65. AGARWAL, V.M., RASTOGI, N. AND RAJU, S.V.S. (2007) Impact of predatory ants on two lepidopteran insect pests in Indian cauliflower agroecosystem. J. Appl. Entomol.131(7), 493-500. RASTOGI, N. (2007) Seasonal pattern in the territorial dynamics of arboreal ant Oecophylla smaragdina (Hymenoptera: Formicidae). J. Bombay Nat. Hist. Soc., India, 104 (1): 30-34. AGARWAL, V.M. AND RASTOGI, N. (2005) Ant diversity in sponge gourd and cauliflower agroecosystems and the potential of predatory ants in insect pest management. Entomon, India, 30 (3). 263-267. RASTOGI, N. (2004) Behavioural strategy of the returning foragers of the arboreal ant Oecophylla smaragdina (Hymenoptera, Formicidae) during the monsoon rains. J. Bombay Nat. Hist. Soc., India, 101 (3) : 388-391. RASTOGI, N., NAIR, P; KOLATKAR, M. AND GADAGKAR, R. (1997) Foraging strategies in the ants Myrmicaria brunnea and Diacamma ceylonense. Some preliminary observations. Entomon, India, 22(1): 79-51. RASTOGI, N., NAIR, P; KOLATKAR, M. AND GADAGKAR, R. (1997) Ant fauna of the Indian institute of Science campus- Survey and some preliminary observations. J. Indian Inst. Sci., 77, 133-140. RASTOGI, P.B. AND RASTOGI, N. (1996) Biodiversity Present situation and future strategy J. Env. Res., India, 6 (2): 63-69. RASTOGI, N. AND PANDEY, M. (1997) Criteria necessary for the separation of Indian ecotypes of Hydra into ecological clusters. Evolucion Biologica, Colombia, Vol VIII & IX, 191-201. RASTOGI, N., PANDEY, M. AND MOOKERJEE, S. (1992) Statistical analysis of geographical variability in sixteen ecotypes of Hydra from India. Evolucion Biologica, Colombia, 6 : 195-210. PRASAD, N. AND MOOKERJEE, S. (1992) Spectrophotometric analysis of DNA content of three cell types in different ecotypes of Hydra. Proc. Zool. Soc, India, 42: 35-38. PRASAD, N. AND MOOKERJEE, S. (1986) Morphogenetic analysis of ecotypes of Indian Hydra. Part- VI: Some Theoretical considerations about species problem in Hydra. Zoological Survey of India, Technical Monograph No. 13. pp 109-118. PRASAD, N. AND MOOKERJEE, S.(1986) Morphogenetic analysis of ecotypes of Indian Hydra, Part- V: Understanding the physiological response. Zoological Survey of India. Technical Monograph No. 13, 75-108. PRASAD, N. AND MOOKERJEE, S. (1986) Morphogenetic analysis of ecotypes of Indian Hydra, Part- IV: Understanding the Behavioural differences. Zoological Survey of Indian. Technical Monograph No. 13, 69-74. PRASAD, N. AND MOOKERJEE, S. (1986) Morphogenetic analysis of ecotypes of Indian Hydra, Part-III: Understanding the ecotypic difference at cell level. Zoological Survey of Indian. Technical Monograph No. 13, pp 45-68. PRASAD, N. AND MOOKERJEE, S. (1986) Morphogenetic analysis of ecotypes of Indian Hydra, Part-II: Understanding the extent of morphological differences. Zoological Survey of India, Technical Monograph No. 13, pp. 9-44. PRASAD, N. AND MOOKERJEE, S. (1986) Morphogenetic analysis of Indian Hydra, Part I: Review of Species of Hydra reported from various parts of the world. Zoological Survey of India, Technical Monograph No. 13, pp 1-8. PRASAD, N. AND MOOKERJEE, S. (1985) Cell aggregation as influenced by divalent cations and trivalent anions and different pH conditions. Advances in Biosciences, India, 4(1): 19-29. PRASAD, N. AND MOOKERJEE, S. (1985) Transcription pattern in some Indian ecotypes of Hydra. Indian J. Exp. Biology, India, 23: 689-691. RASTOGI, N. (2009) Influence of the behaviour and ecology of insect herbivores and the interacting natural enemy species on the strength of trophic cascades in agroecosystems. Proceedings of the Symposium on Functional Biodiversity and Ecophysiology of Animals, held during February 21-23, 2009, at the Department of Zoology, Centre of Advanced Study, Banaras Hindu University, Varanasi, pp.167-179. RASTOGI, N. (2008) Insects as potential ecological indicators of environmental health in anthropogenically disturbed habitats. Proceedings of the National Seminar on Environmental Management in Mining & Allied industries (EMMA-2008) held on 7th & 8th November, 2008 at the Department of Mining Engineering, Institute of Technology, Banaras Hindu University, Varanasi, pp 110-115. RASTOGI, N. (2008) Temporal and spatial dimension in the behavioural ecology of insect pests and its implications in pest monitoring and management. In: Recent Trends in Insect pest Management ((eds. S. Ignacimuthu and S. Jayaraj) Elite Publ., New Delhi 254-260. RASTOGI, N. (2004) Ecologically dominant, predatory ant species as a resource for sustainable insect pest management in plantations In: Sustainable Insect Pest Management (eds. S. Ignacimuthu and S. Jayaraj) Narvosa Publ., New Delhi, pp118-128. RASTOGI, P.B; AND RASTOGI, N. (2000) Pollution vis-a vis Biodiversity In: Environmental Stress: Indication, Mitigation and Eco-conservation (eds. M. Yunus. N. Singh and L. J. de Kok) Kluver Academic Publ., The Netherlands, pp 73-88. RASTOGI, N. AND RASTOGI, P.B. (1998) Impact of habitat loss and habitat fragmentation on biological diversity in: Biodiversity conservation in Managed Forests and Protected Areas (ed. Kotwal/Banerjee) Agro Botanica Publ., pp 156-165. Kumar, D., Rastogi, N. and Singaravel, M. (2009) Functional Biodiversity and Ecophysiology of Animals. Pilgrim Press, Varanasi, India. RASTOGI, N. (2000) Dinosaur Syndrome of science education and its impact on budding scientists. Curr. Sci., 79 (9): 1142. RASTOGI, N. (1995) Why few women scientists reach the top. The Hindustan Times, New Delhi, India, 28 Sep.
RASTOGI, N. (1993) Incomprehensible Prose: Bane of Scientific Communication. Biobytes, Bangalore, India, 1(3): 9. RASTOGI, N. (1996) Macroecology (by James H. Brown) The University of Chicago press, (1995); Tropical Ecology India. 37 (1) 148-149. RASTOGI, N. (1996). Forest Litter Insect Communities-Biology and Chemical Ecology (by T.N. Ananthakrishnan) Oxford IBH Publ. Co. (1996). Tropical Ecology, India, 37(2); 291-292. RASTOGI, N. (1995) Behavioral Mechanisms In Evolutionary Ecology (ed. Leslie A. Real) The University of Chicago Press, Chicago and London (1994), Tropical Ecology 36(2) 261-262.